Grab Slashes Base Rates; Uber Moves To Fixed Fares In M'sia—Who Has The Better Deal? One week ago, Grab announced their new fixed fare rates, promising to be the lowest fares in town. By reducing their charge per km to RM1.10 from RM1.30, Grab purports to have lowered fares to up to 15%. In a series of graphs on their website, Grab compares themselves to a “Competitor X” and claims that their new fares are now lower. On the other side, Uber is now about to implement upfront fares. This means that users will be able to see exactly how much they need to pay before starting the ride. Vulcan Post contacted Uber for more information, and a representative said, “The goal of upfront fares is to make pricing simpler while giving riders more control and certainty when requesting a ride. Upfront fares are determined by considering a variety of factors that typically affect a fare, including expected time, location, surge, traffic, and toll charges. There isn’t much difference in their base fares, with Grab costing RM1 and Uber costing RM0.95. This will only be an issue if you’re in the car for a really short amount of time, but yes, Uber is cheaper by 5 cents. If you’re travelling long enough to make the base fare negligible, then this is where the rate per km calculations will come in. 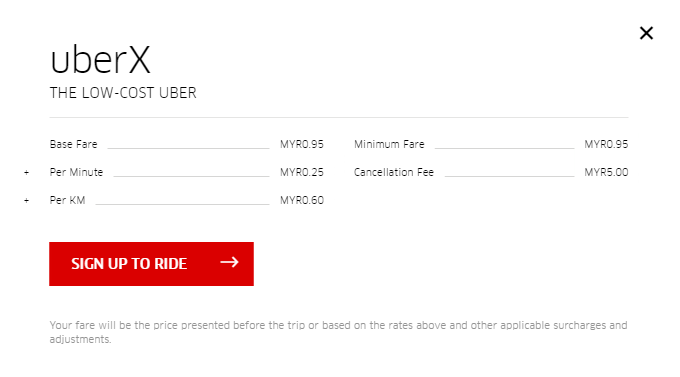 Since Uber did not confirm if their rates were going to change, making a calculation according to their current rates of RM0.60/km and RM0.25/min, if we estimate that the car will cover a kilometre a minute (meaning that the car travels at an average of 60km/hour), the fare should still be cheaper than Grab’s new fare of RM1.10/km (with Uber being a total of RM0.85/km). Of course, if the car is caught in a traffic jam and moves at a rate below 60km/hour, then that’s where the price will start increasing because Uber adds a per minute charge; thus Grab will then become the cheaper option if you’re caught in traffic for a significant amount of time. It’s unknown how Uber is going to take this into consideration when calculating their upfront fares in the future. This move could go wrong for Uber in Malaysia as their recent implementation of upfront fares in Singapore was received with much vitriol and anger. Users claimed that their rides were much more expensive compared to the past, and this even moved many to declare that they were going to move on to Grab. This does beg the question though: if the implementation in Singapore was as unsuccessful as the netizens seem to think, why make the exact same mistake in Malaysia? It’s possible that the online hate for Uber is only by a very vocal minority, thus meaning that the contented majority is happy with the change and are continuing to use Uber. Or, this is a case of major shortsightedness from the Uber crew, and they’re simply just bulldozing ahead with carrying out initiatives despite the obvious negatives. Vulcan Post did attempt to ask the Uber team about this, but the question was not answered. If this is the case, then Uber might have to add Malaysia to the list of countries it has failed in. We would join the ranks of Japan and China, where Uber was edged out by local competitors. Personally, I would like to see Uber and Grab continue with their competition to draw users. After all, if one company dominates the industry, there’s nothing to keep it in balance. As a consumer, it’s in my best interest that both stay healthy. After all, isn’t the market big enough to sustain them both?